The Theatre was opened on June 22, 1932 by the then Duke of York. Reginald New and C.H. Trevor demonstrated this latest type of Compton unit organ in the opening recital and the organ was recorded on 78rpm records by Reginald New, Leslie James and Bruce Wendell. The theatre is now called the ‘Broadway’ Theatre. The organ was restored in 2005 by HWS Associates LLP and regular concerts are planned. 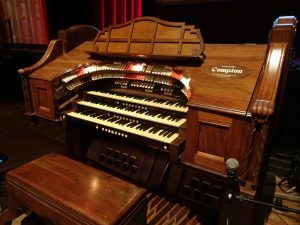 It is hoped that the organ will be used for a variety of purposes, including silent film shows, as the Broadway is now fully equipped as a cinema. In fact, it will be featured as it was originally intended as an organ for all occasions. The first concert after restoration was hosted by Peter Hammond on the 8th March 2009 and featured Simon Gledhill and ‘The New Foxtrot Serenaders’ with Peter also playing piano.